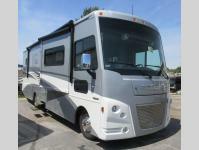 This motorhome is perfect for the family of five seeking adventure. Featuring a TrueComfort + Sofa, which allow the little ones a fun place to sleep, and a dining table with chairs to enjoy a family meal, you'll feel right at home. 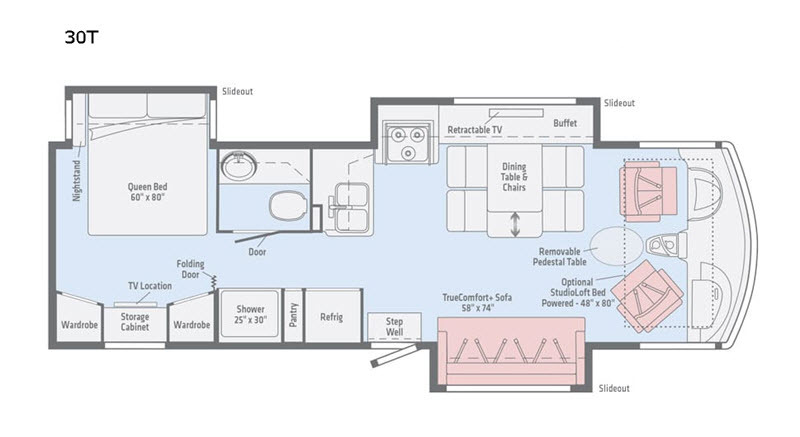 This unit includes a bedroom with a queen bed, a 24" HDTV, and a storage cabinet for all your valuables. The chef in the family will love the kitchen with a 7.5 double door refrigerator, a touch control microwave/oven, and a flip-up countertop extension, that gives extra space to prepare a big breakfast. The bathroom includes a flexible showerhead, a textured glass shower door, and towel rings. Bring along an extra TV with this model including an outdoor entertainment center, complete with a removable TV table, an AC/DC receptacle, and a portable satellite dish hookup. What more can you ask for!? In every Winnebago Adventurer class A gas motorhome you will find a double stainless steel sink, and a three burner cooktop. 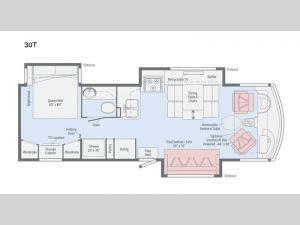 Each unit also features a bathroom syklight to make you feel right at home, and an optional powered loft bed. 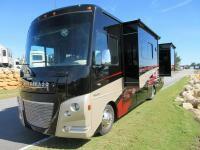 These motorhomes include ample storage areas, plus lighted storage compartments, making packing a breeze. Each model includes a powered patio awning with LED lighting, a pet leash tie down, and automatic entrance door steps. Constructed with a premium high-gloss fiberglass skin, and a Triton engine, the Winnebago Adventurer has been made to last. Come choose the best floorplan for your lifestyle today!